Our mission is to promote the game of golf, and to do so, charities are an integral part of this effort. Golf is not accessible to many people due to the high expense, so we are active in supporting the many charitable golf organizations and raising money ourselves. 100% of the donations made to WebGolfClub Foundation will go directly to promoting the game of golf. All expenses of this charity are paid by WebGolfClub, so that your money can be used for those who need it. Click HERE to see a list containing some of the players, tournaments and charities working to support youth and children organizations. Click on the names to find out more information about their specific work. PGA TOUR players bring their game to St. Jude Children's Research Hospital. Dustin Johnson helps a young St. Jude patient with her putting. Don't throw away your old clubs. Our Professional Staff will cut them down and give them to underprivileged children. 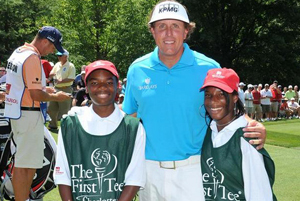 No other charity is more dear to us than The First Tee Program. They have provided MANY WGC Junior Members free golf clubs and lessons. As a result, many of these juniors are playing on High School and College Golf Teams. Please DONATE golf clubs HERE. PGA REACH is the charitable arm of The Professional Golfers Association of America. Founded in 1978, our mission is to positively impact the lives of youth, military veterans, and diverse populations through the creation and utilization of golf programming that supports education, health and wellness, and youth development. To learn more »CLICK HERE.